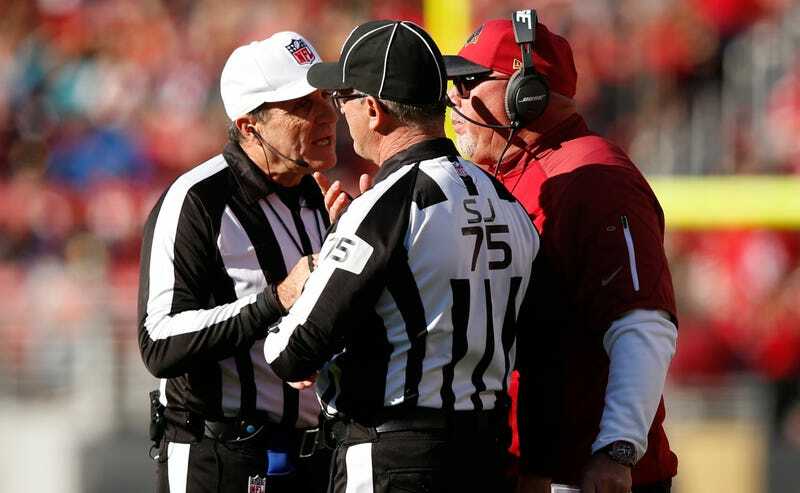 Sunday’s Cardinals-49ers game was a disaster for the officials, one that stood out even against the backdrop of an especially woeful season for the zebras. How bad was it? The crew responsible has been demoted from primetime. Per a source with knowledge of the situation, the NFL has removed referee Pete Morelli’s crew from the Colts-Steelers game to be played on Sunday night. Morelli’s crew has been reassigned to another game. Pete Morelli is one of the most highly respected and highly graded referees in the NFL, so it’s odd that his crew made such a botch of things. But it’s been an awful season for them. It was the Morelli crew that failed to notice 18 seconds tick off the clock during a dead ball late in Steelers-Chargers, and the Morelli crew that missed what should have been a game-ending false start in Jaguars-Ravens. The first mistake nearly swung an outcome; the second did. Sunday’s gaffes weren’t an anomaly, and now the crew is being moved out of a national game. Punishment for officials, beyond receiving bad grades, is exceedingly rare. But this is already the third public chastisement we’ve seen this year. Back judge Greg Wilson was removed from his crew and assigned to a lower-profile game after he missed an obvious illegal-batting call in Seahawks-Lions, and side judge Rob Vernatchi (who’s on Morelli’s crew) was suspended one game with pay for failing to notice the running clock in that Steelers game.